The narrative throughout this book kept me hooked. This is a beautiful, multi-story novel that is so well done that you cry. I sighed a huge sigh after finishing and gently placed the book down as if it were a baby. The amazing part of this is that I read the ARC of this novel. I can only imagine how beautiful the published version must be with corrections and additions. If you loved Margaret Atwood's The Blind Assassin, you'll love this even more. “Masterly…The vignettes provide deft reprieves, a mosaic of a community and its connection to the tragedy. And connection—the way people and their lives fuse—is this novel’s main concern." "An attempt to map how the unbearable is borne, elegantly written and bravely imagined." "Clegg is both delicately lyrical and emotionally direct in this masterful novel, which strives to show how people make bearable what is unbearable, offering consolation in small but meaningful gestures. Both ineffably sad and deeply inspiring, this mesmerizing novel makes for a powerful debut." "I marveled my way through Did You Ever Have a Family, at not just the masterful writing and storytelling, but at the emotional authenticities of every persuasion. It's a wondrous thing when a writer gets things this right, this absorbing, and this beautiful. Bravo, Bill Clegg, and thank you." "Full of small-town secrets and whispers, Bill Clegg has woven a richly textured tale of loss and healing. This is a deeply optimistic book about the power of human sympathy to pull us from the wreckage of our fate." "The force, range, and scope of Bill Clegg’s Did You Ever Have a Family will grab you with its opening lines, and won’t let go until its final one. I can’t recall another novel that so effortlessly weds a nuanced, lyrical voice to an unflinching vision of just how badly things can go for people. I read it deep into the night, all the way through, telling myself it was getting late, I could finish the book in the morning. I finished it that night, however, slept a few hours, and then, in the morning, started reading it again." "Like the question it poses, Did You Ever Have a Family is brutally direct yet it's got an enormous symbolic power. You hold in your hands a great book of kindness—every restrained, exquisite sentence comes loaded for bear. It's been a lot of years since a novel has so moved me. Number Bill Clegg among that endangered species: major American writer." "Clegg is a gimlet-eyed observer and is masterly at deftly sucking in the reader as he fashions an emotional tsunami into a profound, mesmerizing description." "A quiet novel of devastating power. Clegg has drawn a tale of prodigious tenderness and lyricism.... that reveals the depths of the human heart. [Did You Ever Have a Family] is a wonderful and deeply moving novel, which compels us to look directly into the dark night of our deepest fears and then quietly, step by tiny step, guides us towards the first pink smudges of the dawn." “This first novel arrives with a shout…Clegg covers the full spectrum of human emotion in this beautifully nuanced story." “In measured prose, Clegg unspools the stories of June and the other survivors as they face unimaginable horror and take their first halting steps toward hope and community." 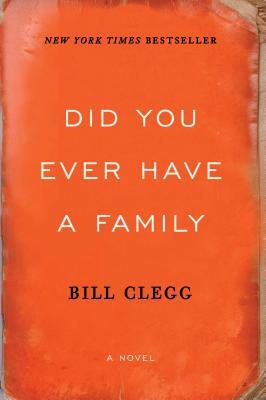 "Did You Ever Have a Family is the first full-length foray into fiction for Bill Clegg... but it reads like the quietly assured work of a veteran novelist.... it’s rare to find a book that renders unimaginable loss in such an eloquent, elegant voice." "This isn’t your typical mystery, it’s something better: a real-life thriller in which resolution takes the form of acceptance. While [Clegg] never suggests anything as simplistic as closure for these tormented souls, he manages to find ways for them to move forward from this tragedy, making it seem a little less random than it did at the beginning, and that in and of itself is a kind of mercy."